I have a question for the military re-enactors. In 1803 the order went out, "To avoid excessive wear on the hats. henceforth, the salute shall be given by presenting the open hand to the brow." I'm part of a Lewis and Clark group (in 1804) and we interpret that to be palm facing out (British style). Any idea whether this is correct? If so, when did they switch to the palm down? All growed up and still playin' Cowboy! This is an interesting topic ... and definitely can cause some confusion. 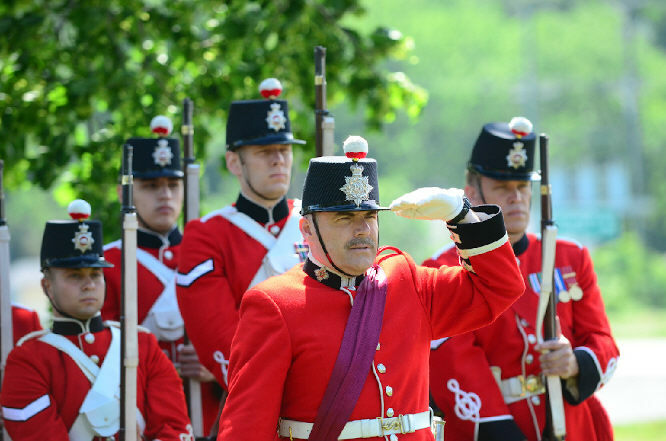 Just a quick addition to the above ... here is a photograph of the Ceremonial guard of the Royal Hamilton Light Infantry (Canadian) who are uniformed and equipped as their predecessor 13th Battalion of Volunteer Militia Infantry, circa 1866 (at the time of the Fenian Raid which resulted in the Battle of Ridgeway on the Niagara peninsula, in which the 13th Battalion took part. Based on the obviously Black Leather band, I would suggest it (the watch) is quite possibly a faithful (faithless) reproduction of and early French apparition of a "watch" which graces his wrist. Confusing me even further is some documentary movie images of British NAVAL officers saluting palm down, like Americans, whereas the British Army salutes palm outward! Any comments? 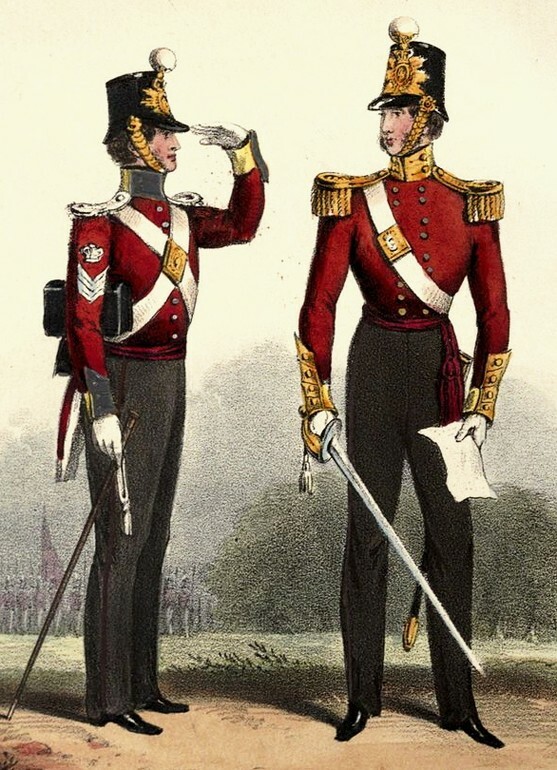 IIRC, in the 18th Century there was no "hand salute" as we know it but rather the hat was removed from the head by a junior when rendering honors to a senior and the senior would respond appropriately. Eventually this was simplified to simply touching the brim of the hat. This was Naval custom and, I think, Marine Corps. I'm open to correction on Marine Corps custom. I don't know for sure about land forces but my recollection is that their custom was similar. As to palm out or down, one reference says that the Navy salute was palm down as sailors on windjammers were frequently working with tarred ropes meaning their hands were always dirty. It was considered undignified, and maybe insulting, to show a dirty hand to an officer so the palm was turned down. I don't know that this is correct but it makes as much sense as any other explanation I've read. The Navy has long permitted saluting with the left hand if the right one is occupied or missing. 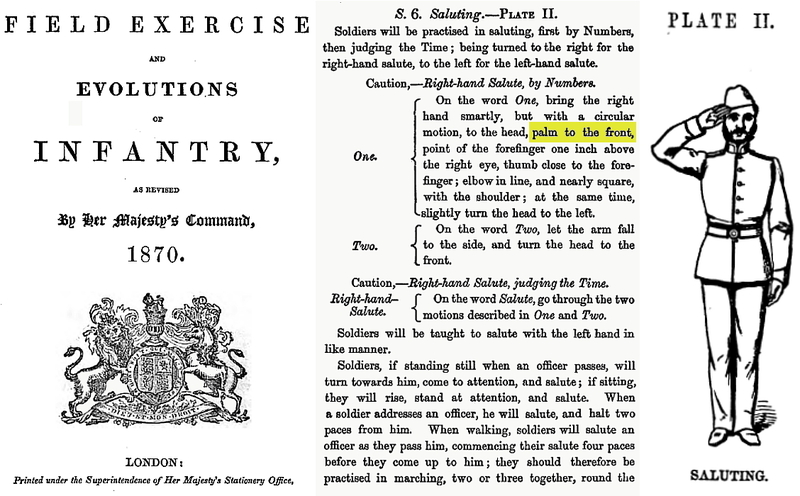 I was unaware of the British custom of using either hand until I read it here. You learn something new every day!!! Different services have different etiquette on when and where to salute. That would require a whole new thread, however. 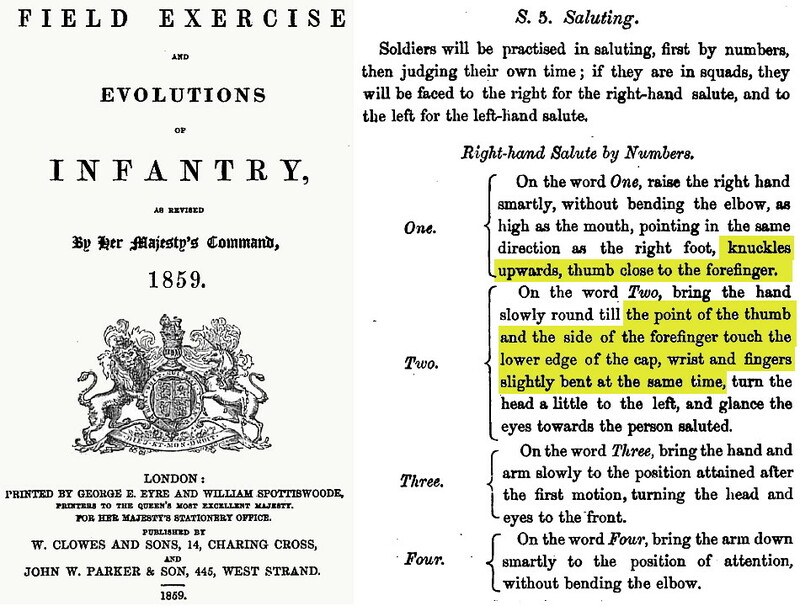 Narrowing down the date of the change to "palm forward" in the British Army even more, I am advised on the other forum that the 1867 version of "Field Exercises and Evolutions" still specified the "palm down" salute. Prior to 1968, the RCAF, CA, RCN had the same salute as the Brits. When the Liberal government of the day decided to amalgamate the three services into an all singing, all dancing, green uniformed Canadian Forces, the salute went to palm facing down. The RCMP still use the palm facing forward salute. One thing about the origin of the salute was to show a stranger being greeted (possibly an enemy of person of unknown intentions) that the person initiating the salute did not have a weapon in the hand (hence the palm facing outward). At least that is the story we were told in AFROTC in the early 1960's. In many "historical" films and in literature, it is shown or described that British Tars (seamen), if not wearing headgear, would "tug their forelock" when in the presence of an officer, rather than salute. Many military traditions specify that salutes are NOT rendered when "uncovered" - not wearing a hat. Is this "tugging" simply a substitute demonstration of deference or subordination in lieu of a salute? Was it regulation, or simply an unofficial courtesy? I've also heard that the Brits were supposed to salute open palm because they lost the Revolutionary War to us.